Wait, a whole week has gone by since my last blog post, and now it's Tuesday...which means another Pet Peeves post! New readers might think I'm a bit of a curmudgeon, but I'm not. I promise. In fact, this weekly Peeve Post is my newly conceived chance to let it all hang out. So here it goes: My 2nd Pet Peeve is when friends don't take the time to visit after you have a baby. My kids are now 5 and almost 3 and yet-- and yet-- I can still remember any friend who came by our home to visit with me after having my son and daughter. There is something about the exhaustion, elation, vulnerability-- all of it-- that makes new mothers REALLY need loyal friends when we are home with a new baby. It is hard for me to forget those who never got around to visiting, or even calling or checking in, when they knew I was home solo with a baby. That postpartum period is one of those times in your life that can be friendship making or friendship breaking. We learn as we go in life, and maybe it takes having a child to really understand this one, but now, no matter how "busy" I am, I make the effort to visit with a mother and her baby (or invite them over in case she wants OUT of the house). It means so much to me, it must mean something to other moms out there, right? Join me in my weekly vent! What about you? What's one of your peeves? 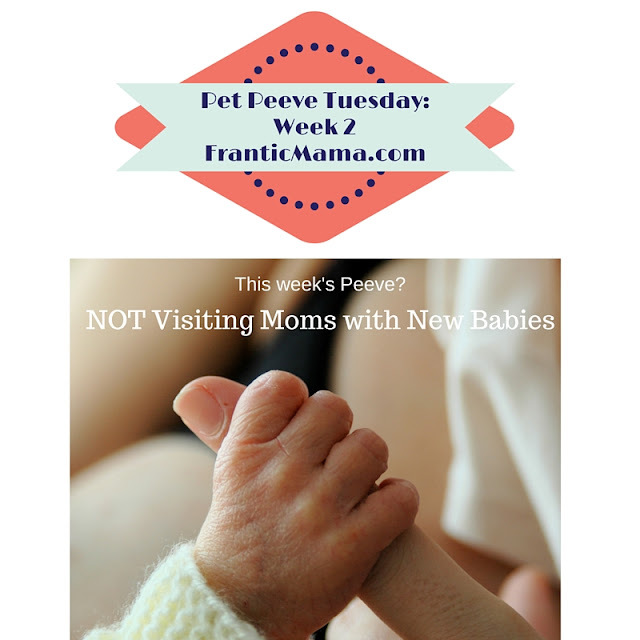 Check out last week's Pet Peeve here. I know that I really appreciate childless friends who at least try to "get" what it's like to visit/do things when you have kids, and accommodate accordingly! I've seen complaining on Scary Mommy about "look, you don't get to be all sanctimonious and know it all when you have kids," and I sort of get where they're coming from... but it DOES change when you're toting little ones around and working around naptimes and desperately trying to keep them from screaming in a restaurant... anyway, /rant! Thank you! I don't why this made me feel better(after a good cry).Maybe I found relief.Like I did when two years ago I was so under the cloud everyone thought I was invisible(or the other way round!) I found 'angel in a white coat' over at mamalode. I remember rereading my ancient copy of 'little women' right after.I just got it out again.A thank you just isn't enough. l never expected meals but some little company. I had to look for it on the internet. It hurts somewhere still. PS: pet peeves ah! you lightened my heart ,I 'll ignore them for now!! I'm so honored to have played a small supportive roll in your life! Thank you for reading and sharing your thoughts. I find myself often telling people how I have "met" friends online through blogs, and I'm not sure everyone gets it, but it is true. Some of my closest mom allies lives across the world, and I've only met them on the computer. I might have to read Little Women again soon too; it has been years and years.